And in case anyone (ahem, Bethany) was wondering if my counters were always so tidy, here is a more realistic photo of what our kitchen might look like on a regular basis. (circa 2007-- my counters are always messy so why would I take a more recent photo of them?). The yellow is awfully bright and cheerful, no? Now I just have to figure out what to put over the hutch in the dining area... Got any good non-cluttery-looking ideas? It's Tuesday, which means I'm hanging out with Darcy again. Very cheery, Marsha. It looks terrific... sorry, no suggestions on the hutch; after living here 6 years and still having pics on the floor I am not qualified! The yellow looks great, Marsha! I can't believe you painted the entire room, got it all put back together and posted pictures on Facebook *all* in one day. You, my dear, are a rock star! I like Darcy's idea of a B&W photo. Or you could do a painting. I agree with Darcy. B&W all the way! We have a tiny kitchen, so our counters are never tidy enough for me. Fun color! I am awful at decorating, so I have no suggestions for the wall, but I do like the picture idea! It's amazing how a color transforms a room. It looks so warm and inviting now. Love it! wow! 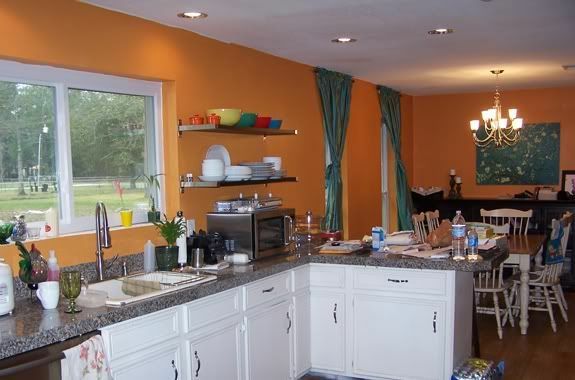 It looks like a completely different kitchen! Color changes everything! I loooooooooove it! It is MUCH brighter. I loved the old color too, but this one IS much more cheery! :) I love you! the yellow is fantabulous! 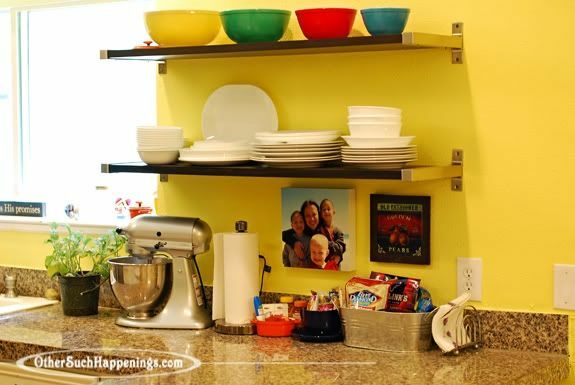 have you always had no upper cabinets? i love it. so daring. i couldn't do it. my cabinets are a walking, talking mess. how about letting this be your cec opportunity. string some line, about 3 rows above your hutch, bet some tiny, maybe paint them, clothespins and hang them up right there. you can see them every day and smile. Love the yellow!! It looks awesome and those colorful bowls...don't get me started!! You know above your hutch you can do a plate arrangement. Have you ever seen those on the Nester??? LOVE HER!!! Love it! Yellow always reminds me of my grandmother -- it was her favorite color and rightly so. She was the sunshine to so many and a great cook. 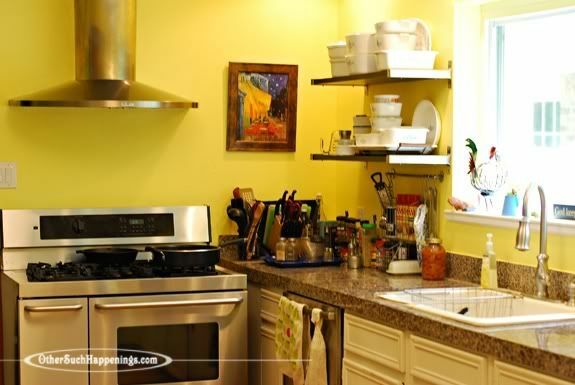 So a yellow kitchen is perfect. GREAT choice! 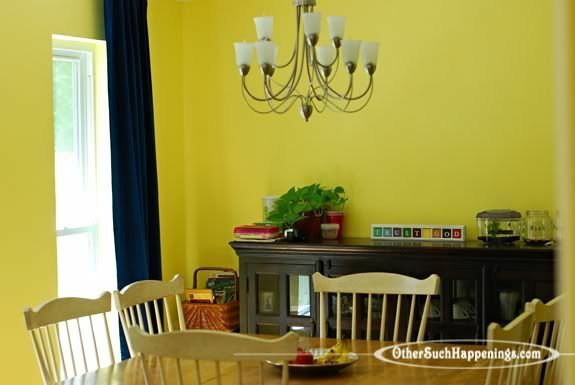 I love that yellow, it really is cheerful! What a wonderful update! Isn't it amazing what some paint can do??? Beautiful! I am a clutter lover...I confess. I need some paint. really. My walls are still the same off white we moved in with 5 years ago.